Newspaper Rock: Tonto's craziness justifies crow headdress? Johnny Depp's Tonto supposedly is half-crazed because of a childhood trauma. Does that excuse the bird on his head and other oddities? The hunter is trapped in a world of dinosaurs, so of course he's a savage Indian. The white man killed his wife and children, so of course he's a savage Indian. The burial ground is haunted, so of course he's a savage Indian (ghost). The military veteran was traumatized by war, so of course he's a savage Indian. The tribe was cursed by an evil shaman, so of course he's a savage Indian (werewolf). What do these tropes have in common? The Native character is uncivilized or savage every time. Sure, there's a reason, but the reason is an invention to justify the savagery. It's not historically or culturally valid. Whether they're Native or not, half-crazed people don't act out their mental problems by wearing strange headgear. In short, we want a character who isn't a half-naked warrior in facepaint and a (crow) headdress, not another excuse for the same old stereotypes. In Thomas King's Inconvenient Indian he discusses the portrayal of "dead Indians" (preferred) and the avoidance of any decent, realistic representation of live, modern-day Indians. This is the reference I am making in the above comment. I stand by my comment. Why on earth would the movie have any representation of modern-day natives when the movie itself doesn't take place anywhere near present day? The framing device, that is decidedly locked in place in the 1930's fair--in a tent, no less--isn't exactly the best place to feature anything of the sort. It is your peragotive to be offended, if you want, but I hope you realize that it's not because of the movie--it's because you're looking for excuses to be offended. And you seem to be looking for reasons to excuse the problems with the movie. You can't defend writer choices with the in-story justification, because the writers CREATED that justification. Maybe they came up with trauma reason after they decided that Tonto would speak broken English (problematic), or maybe they decided to have Tonto speak broken English because they wanted a way to show he was traumatized (not as problematic, though, psychologically, that doesn't make any sense), but either way, they made the CHOICE to have the main Indian character speak broken English when there was no objective reason to do so. Let's back up. Everything we see in a movie is a deliberate choice on the part of someone. Some choices are required by the story. If you're going to make a movie about the Lone Ranger, there are somethings that are objectively required for it to be the story of the Lone Ranger. You need the white horse. You need Tonto. You need the Ranger. You do not need a senile old guy in a fair tent. You don't need a narrator who casts himself in a supporting role. You don't need broken English. All of those are deliberate choices by the writers, the actors, the director, etc. The decision to have Tonto speak in broken English was obviously not driven by a desire for historical accuracy. Otherwise, someone (not the Comanche, but someone) if not multiple someones would speak Spanish. So you can't defend that choice by pointing to history. Nor can you defend it based on Tonto's trauma history, because 1) that history is another deliberate choice by the writers, not an objective requirement of the story and 2) it is not the only way to show a trauma history. IMO, it is a very bad way of showing such. The fact that people who claimed they were trying to challenge stereotypes instead made a movie full of them shows the problem with these pervasive images. When this is all they see, they are unable to imagine anything else.What's the alternative to an aged Tonto narrating the story from his point of view? It would've been easy to have a modern Indian--Tonto's grandson or great-grandson--serve as the framing device. But that wouldn't have conveyed the same message about the tragic, vanishing Indians. As Terrie S. said, having Depp play a sideshow freak in the 1930s was a choice, not a necessity. This choice "solidifies the continuing views of Native peoples as lesser, as relics of the past, as disappearing, as roadblocks to 'progress.'" Since I was replying to your comments on his speech, that's why I focused on his speech. It's not my main concern, its simply the topic of the discussion. And I'd say Tonto's still a sidekick. Maybe not as low ranking, but still a sidekick. I would argue that, in some ways, this is worse, because Tonto is the one telling the story, yet is not the focus of the movie. He casts himself in the supporting role. This is not the story of how Tonto, with the help of a white guy, got justice for the slaughter of his people. It's the story of how John Reid, with the help of a crazy Indian guy with a bird on his head, became the Lone Ranger. Which would be fine, except that, again, this is apparently how Tonto himself thinks of his own story--that it's the story of someone else. No, that is not fact, that is how you want to view the story--which is simply inaccurate. Tonto tells the story exactly how it happened in his view. He is never a sidekick--he even has a big scene where he SMACKS DOWN Reid and calls him out for being a coward. He SAVES Reid not once, not twice, but three times in the story. He has his own story of vengeance come to a close because he managed to work together with a person he initially didn't want to work with. To call him a sidekick is to knowingly tear down the character to make a point in an argument that is only created by you. He can do all those things and still be a sidekick. After all, DC gave Robin leadership of the Titans, with his own stories and moments of awesomeness but he was still Batman's sidekick. Understand, I'm looking at this from a meta, narrative level, not the level of character actions. The story starts with John Reid on a train, setting in motion the events which will result in him meeting Tonto. From a narrative perspective, this places Tonto's story subordinate to his. This is something that (again, narratively) is very hard to avoid. The movie Rush Hour is a good example of how writers might try to avoid this in the buddy movie--start with one character, but have the story take places on the other character's home territory. But that's not an option here, so one story must be given more weight than the other and the writers chose to give more weight to Reid. And, by using the framing device they did, they gave that view to Tonto. Ironically, it would have not been an issue had they dropped the framing, but they didn't make that choice, so that's simply a case of what might have been. Which leads me back to what you said. Tonto does not tell the story as how it happened in his view, because Tonto does not exist. The writers and actors and directors made all those choices. They are the ones who made the choice to have a movie where a Native character tells a story that follows the arc of someone else. They made the choice to make Tonto, narratively, the sidekick and to combine that with the choice to make him the "narrator" of the story. 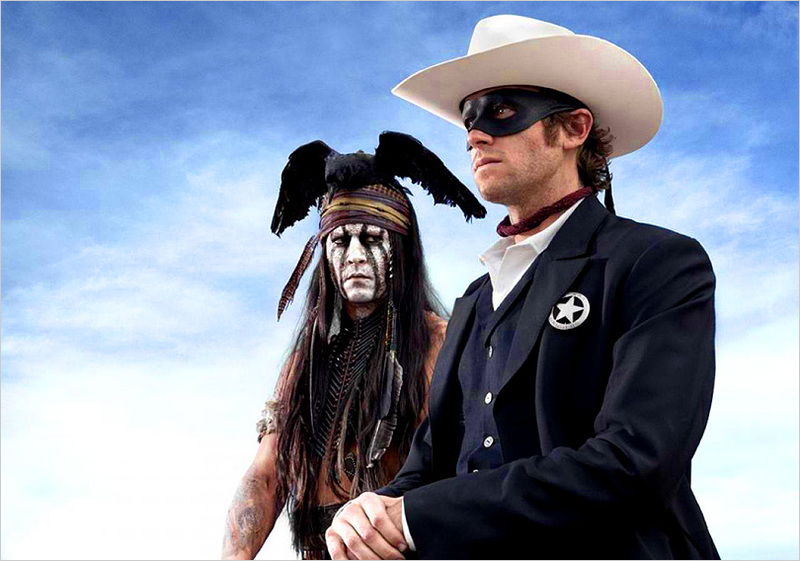 My most basic problem with the movie is this: Depp talked about wanting to move Tonto and Native characters out of the role of sidekick, yet when the character of Tonto has a chance to tell the story, it's the story of... the white guy. The character casts himself as the sidekick. And we, the audience, are told this from the get-go. Most stories that use the framing device of "And it was told by X side character" reveal this at the end, which makes us relook at what we've just seen, read or heard, to reconsider that "side" character or wonder if what we've been told is reliable. But we're not given any of that, so the framing device just reinforces all the issues of the movie.To reiterate the point, you can justify anything within a movie's "logic." The black guy had to die and the woman had to be taken hostage because they were the only characters available. These things "had" to happen so the white guy could be the hero. But again, these are choices by the creators, not immutable facts. If you look for and find an excuse to portray a savage Indian, you're not giving yourself a valid out. You're still portraying a savage Indian. And that's still stereotypical if not racist.